Goes anywhere, used everywhere. Durable and designed for multi-device high-traffic use. Our wall-mounted charging kiosk is perfect for high traffic areas where space is limited. Built from commercial grade, durable materials it can be combined with our floor stand for a freestanding option. With a convenient ledge for charging phones, custom branding and simple setup options, the M8 wall-mounted charging kiosk works in any space. 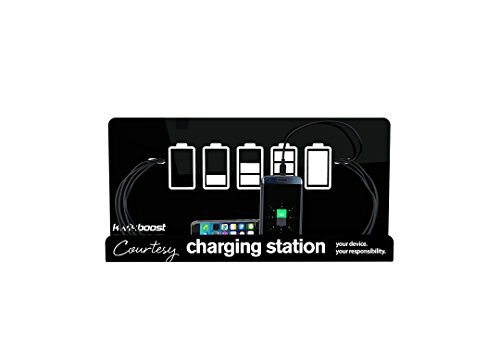 KwikBoost phone charging stations feature a patented unibody design for the main billboard display and ledge. Unibody construction means a higher-precision, less-complex design with fewer parts. This translates to a charging station that's exceptionally thin and light, yet durable enough to handle the rigors of everyday use. POWERFUL, BEST IN CLASS CHARGING STATION: Multi device charging for up to 8 devices (3 Apple Lightning, 3 Micro USB, 2 USB Type-C). Full speed battery boosting for all devices at once. Portable and fully compatible with nearly all gadgets. Super fast charge for Apple iOS, Google Android, Amazon Kindle, e-reader, tablet, cell phone, and other tech equipment. Features intelligent, efficient technology with automatic authentication of nearly all mobile gear (99%) to eliminate overcharging. SHOWCASE AND ATTRACT PEOPLE TO YOUR BRAND: Fill a need and solve a problem for your clients to make your organization more attractive. Provide a service that will keep customers, new prospects and guests coming back to hotspots. Associate your logo or trademark with sophistication and show your patrons that you understand their needs. Gain repeat business by keeping people coming back again and again. Drive brand engagement in a positive and memorable way. Perfect for public places and events. MAKE YOUR SPACE MORE INVITING: Creates a useful meeting or meet up spot. Stand out with a cool way to attract a crowd. Everyone has a cell phone or electronic device. Those devices need to be charged constantly. Low battery is a reason why people leave. Give people an excuse to hang out and linger in your desired location. Generate even more foot traffic with the presence of a group. Increase client happiness while they wait. Get noticed, gain attention and add value for your clientele. CERTIFIED, PROTECTED AND GUARANTEED: One year warranty and service plan included. Input surge and reverse voltage protection. Includes all essential certifications & more. Ask us or your tech guy what this stuff means: FCC, UL, CUL, CE, RoHS, MFI, ESD-IEC 61000-4-2 and PL-IEC 6100-4-5. Cables + charging components also MFI certified. We guarantee your satisfaction with our products. Made in the USA. Highly recyclable. 'Kwik' Easy setup. Plug and play. 2.4A per port. Requires 1 standard outlet. ENGINEERED FOR HEAVY USAGE: Commercial grade charging connectors. Durable for lobbies, waiting rooms, trade shows, concerts, hospitals, universities, malls, stadiums, airports, hotels, retail, corporate offices, events, students and professionals that rely on their phones. Works with any model wireless device: iPhone, Samsung, HTC, LG, Motorola, Sony, iPad, Galaxy, Nexus plus more. Lightweight but strong and lasting design. Custom billboard graphics available for personalized branding. If you have any questions about this product by KwikBoost, contact us by completing and submitting the form below. If you are looking for a specif part number, please include it with your message.